In December 2014, the Obama administration established the Central American Minors (CAM) Refugee/Parole Program, an in-country refugee processing program for minors in El Salvador, Guatemala, and Honduras deemed deserving of humanitarian protection in the United States. An element of the government’s response to the 2014 surge in arrivals at the U.S.-Mexico border of unaccompanied minors from Central America, the CAM program seeks to provide certain minors with a legal, safe alternative to undertaking dangerous, unauthorized journeys to the United States. In fiscal year (FY) 2014, almost 69,000 unaccompanied minors were apprehended by the U.S. Border Patrol, up from 39,000 in FY 2013 and 24,000 the prior year. Unlike in prior years, when Mexico was the top sending country, the majority of unaccompanied children (UACs) in 2014 came from Central America’s Northern Triangle countries of El Salvador, Guatemala, and Honduras. The growing power of gangs and organized-crime groups, as well as rising rates of homicide, drug trafficking, human trafficking, and gender-based violence in the region are well documented, and the new CAM in-country processing program was created with the aim of providing minors affected by violence in Central America the ability to legally reunite with parents living lawfully in the United States. 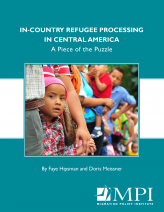 This report provides an overview of the CAM program and its operations, and reviews the history of U.S. in-country processing programs, which date to the 1970s and have operated in countries including Vietnam, Haiti, Cuba, and Iraq. It also examines the issues such programs have raised about goals, participation rates, and the process and criteria for in-country applications.